The Course Be Clear, There's Nothing To Fear! 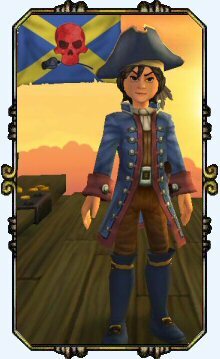 Garrett Hawkins is the first pirate, and very first KingsIsle character altogether for my husband. Our son had one requirement, his first character had to have the last name Hawkins. The rest was left to Daddy. And this is who he came up with. His very first pirate – Wicked Garrett Hawkins! Out in the real world, Dad is an Evil Wordsmith who spins words so vile they dare not be put on paper. Yeah yeah, all bark. He’s a Bard who likes to tell funny and frightful tales. And he’s pretty good at it actually. Though his tales are not for kids! He’s also a business man and owns his own Fire Protection Sprinkler company. If you look up over your head and see a sprinkler, he’s the kind of guy who designed the installation and managed the construction that built the system. He has watched us play Wizard for years and now Pirate. He’s not much on the Wizarding world, but the Pirate world has intrigued him and today when received our mail and discovered Marco Pollo’s map, we had two extra codes to use for our free gift from KI. Before we simply gave them away, we asked Daddy if he wanted to become a member of Pirate and use one of the codes for his own pirate. We were both pleasantly surprised when he said, yeah sure. Yeah! Garrett’s parents were said to have been Mutineers. You can’t trust a pirate! He was raised in Skull Island, bouncing around from Skull Island itself to Jonah Island where he learned the skills of a privateer from the well connected Frogfather. 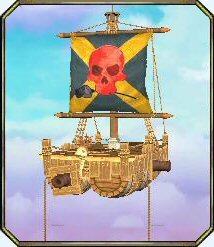 His ships flag is a bloody red Jolly Roger clinching a black rose in his gnarly teeth. On a field of blue, marked by a yellow X. Well of course he picked an X, it marks the spot for treasure and gold doesn’t it? Watch out for this wicked and evil pirate. He will make you deal that you can’t refuse and he has no qualms about double crossing his best friend. No matter who that is at the moment. As most privateers are grand leaders, they also make no deal that doesn’t give them the edge and bigger profit. All while making you think it was totally your idea. 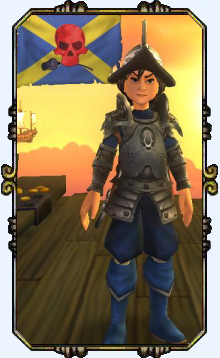 Garrett is currently a level 16 Privateer. He is currently Pirating in Monquista with his first mate, Egg Pao. Keep up to date with his adventures through the Captian’s Log. He has made alliances with several folk through the spiral. Egg Pao – A Ninja Pig – A gift from solving the clues on Marco Pollo’s Map. 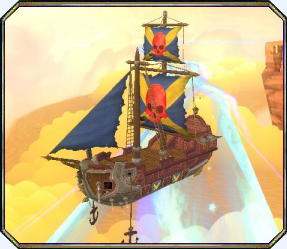 Garrett’s ships will be sleek and mean, so watch out for them in the Pirate skyways! He has plans for two homes, one for business and one for escape and relaxation. His Pirate quarters on Skull Island are always used when he comes to town on business. © 2012-2013 A Pirate’s Portal; Springwolf, D.D., Ph.D. All Rights Reserved. The Course Be Clear, There's Nothing To Fear. So Hoist The Sails and Let's Tell Some Tales!